Event Description : It’s our Favourite time of the year which means its time to shimmer and shine and adorn yourself with treasures worthy of celebrations. And what better than to join us for a very special show curated just for you by The Wishlist in its super special season Ten (X). Its time to celebrate our curated collaborations over the years and welcome amazing new talent on board as well. From magical weaves of Benaras to traditional threads of the South, from fancy footwear and jewels to handcrafted treasures for your home and to gift to loved ones! Also Showcasing Collections of award winning Weavers and Artisans of India. This and lots more only at The Festive Wishlist this October! This season we have some exciting collaborations with interesting re-interpretations of traditional designs in new contemporary ways! Our participating vendors all share the same ideology - promoting handmade, handcrafted products, made by or in collaboration with local artisans and craftsmen - the true essence of The Wishlist! From Banarasi weaves to the Shibori craft and Chanderi splendour, we learn something new with each show and season and the travels that it entails. Handcrafted jewellery, organic sustainable fabrics, Organically dyed handwoven apparel and beautifully crafted products for your home, there is a different treasure for everyone to discover and appreciate! Come join us as we unveil a special festive collection bringing you the best in fashion, lifestyle, Indian textiles, and home at THE WISHLIST. About The Wishlist : Founded in 2015, The Wishlist has a mission to discover and showcase unique talents in the fields of lifestyle and fashion. Having an extensive background in art and fashion, our team came together to rediscover and reveal the beautiful crafts of gifted designers. 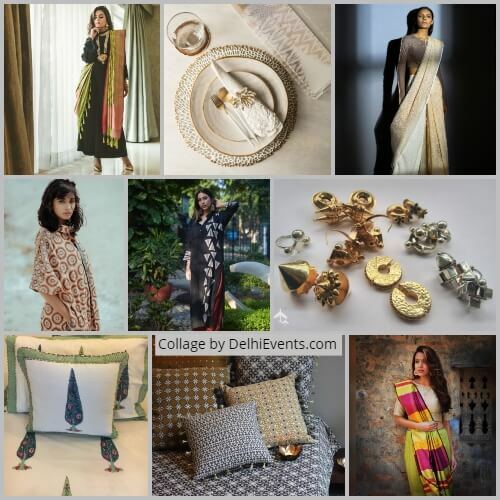 Passionate about what we do, we love curating unique pieces, discovering hidden treasures, wanting to connect our customers with the craft of Designers/Weavers/ Collectors/Artisans from all over our India. Presenting a special selection of talented artists and designers,our vision is to curate a pop-up shop for every season! We wish to create a platform for new and enthusiastic designers in the realms of garments, home apparel, accessories and also to celebrate and highlight the real creators and craftsmen of all things beautiful.